uplifting (!) enthusiasm for life. This show is not just for belly dancers, but for everyone. Whether you have experienced cancer yourself, have known someone with it, or are dealing with it now, this show is the light at the end of the tunnel. I am proud to announce that myself, along with fellow teacher Anne Kingston, are organising this event in Preston this year. 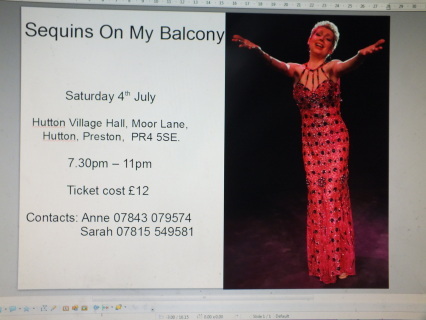 Saturday 4th July, Hutton Village Hall, Moor Lane, Hutton, Preston, Lancashire, PR4 5SE. 7.30pm. Anne is also planning on teaching a FREE one hour workshop for women recovering from breast cancer during the day, from 4pm - 5pm. If you would like to attend this workshop, please contact me with your name and I shall add you to the list. Tickets for the show cost just £12.00 each and can be bought here using the link below. Please note that any tickets bought now will be put on the door for collection on Saturday evening. In the meantime, the news has spread about the show, as you can see in the picture opposite. This is the local newsletter which gets issued three times a year. Here is a list of raffle prizes obtained so far (as of 9th May 2015). More will be added as and when. 27th) Two bottles of wine (one red - Millevini Provincia Di Pavia Pinot Grigio Blush, one white - Premier Estates Chardonnay) PLUS a premium box of Thornton's chocolates, donated by Bargain Booze, Hesketh Bank. More prizes may be added to this list which could affect the order of the prizes, so please keep checking. I have just received a £50 donation from Plox Motors in Tarleton towards our charity. I cannot thank Judith enough for her kind donation. Thank-you so much. Special thanks need to go to H. Edmundson Motors of Hesketh Bank who have donated £50 to Just Because. Also to Johnson's Butchers of Hesketh Bank who have donated £25 to Just Because. Last but by no means least, to Andy of Cheethams Tower Garage in Tarleton for his donation of £50. Now that the show is over and I've had a day to recover, here is a list of all those people who helped make this happen. To those who provided sponsorship : - Plox Motors, H. Edmundson Motors, Johnson's Butchers and Cheetham's Tower Garage. Raffle Prize Providers: - Penwortham Carpets, Gymnophobics, The Salmesbury Hotel, Student's Driving School (Ann Gray), Red Hairdressers, Elements Day Spa, Martin Mere, Bangla Fusion, Penwortham Leisure Centre, Flamingo Fashion, Dunscar Garden Centre, The Rufford Arms Hotel, Victoria Leisure and Fitness, Toria Beauty Secrets, Mystery Tea House, Studio 28, Be Beautiful, Connective Healing, Don Alberto's, Coffee Exchange Company, Bargain Booze (Hesketh Bank), Coe Lane Farm Shop, Odeon Cinema (Preston), Salvatores, The Chocolate Rooms, Subway, Booths (Longton), Pristine Car Wash, Tylers Barbers, Just Because, Aphrodite Health Foods, Pamela Jane Florist, Yvette Cowles, Anne Kingston, and The Cow Shed. Abi Hopkins - for taking photos, selling raffle tickets, manning the Just Because stall and lots of other jobs I'm sure I don't know about yet, and all that after attending workshops all afternoon! Philip and Gail - who helped clear the room and put tables and chairs away for us. IF I have forgotten anybody, I can only apologize. Just private message me and tell me off.